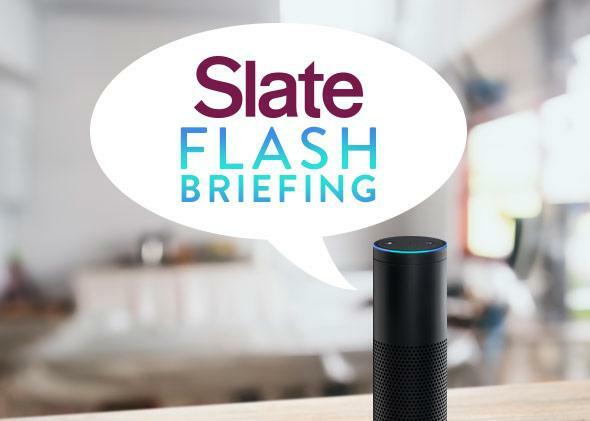 Slate’s flash briefing on Amazon Echo, 90 Seconds With Slate. Slate Comes to Amazon Echo! Ask Alexa for a briefing from inside the Slate offices. Photo illustration by Natalie Matthews-Ramo. Photos by Amazon and Thinkstock. Amazon Echo, as the Culture Gabfest learned a few weeks ago, is a pretty cool device. I’ve certainly enjoyed using it to order 64 rolls of toilet paper for my friends when they step out of the room. But now, Slate is coming to Echo! I’m hosting “90 Seconds With Slate,” our Echo flash briefing—a bite-size nugget of culture, politics, tech, or sports news, delivered (for now) three times a week. (Archive here.) What upcoming events are Slate staffers looking forward to? What music is playing on Slatesters’ headphones? What’s today’s biggest news story (or most foolish internet kerfuffle)? To listen: Go to Settings inside your Alexa app. Choose “Flash Briefing,” and select Slate as one of your trusted news sources. (Obviously, in a perfect world, you would also turn off all the other news sources.) Then ask your Echo, “Alexa, what’s going on?” or “Alexa, what’s the news?” We’ll make it fun—all you have to do is listen.